Eagle 1976 Cabinet Two Door Manual Three Shelves 24 Gal. 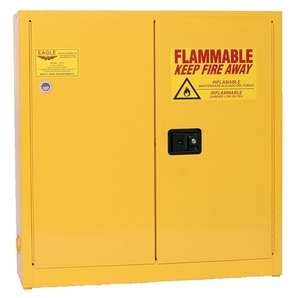 Eagle Manufacturing Model 1976 Flammable Liquid Safety Storage Cabinet. 24 gal. - 2 Manual Shelves 43"x12"x44" 214 lbs. Product Reviews for Eagle 1976 Cabinet Two Door Manual Three Shelves 24 Gal.